For those waiting to see how the art world would respond to the recession, your answer lies within the walls of the formerly vacant Dia Art Foundation’s Chelsea building where the nonprofit X Initiative has taken up the challenge of utilizing the recently unoccupied space. X, a year long project whose goal is to “inspire and challenge us to think about new possibilities for experiencing and producing contemporary art,” will organize art events in four phases. As a sign of the times, X has organized the festival “No Soul For Sale: A Festival of Independents,” as a transitional event bridging Phase 1 and Phase 2, and has invited 40 international nonprofits to present anything they want at no charge, a truly revolutionary idea in the age of high-priced art fairs. But this is no art fair. This is a festival based on the idea of hospitality and sharing. According to X’s Director, Cecilia Alemani, a well-known independent curator, the festival is a true reflection of our current economic situation. “We are born out of the recession, because this would never have happened before. We got a space because the corporation that owns the building could not rent it out and so it was vacant for a few years. It is a reflection of what is going on in the world. We are fortunate and lucky that we can use the space for free and we really wanted to share it.” Aside from the lack of participation fee, the festival is unique from an art fair also in that there are no walls separating one participant from another, and the work is not for sale. 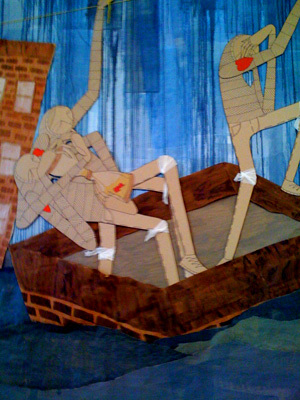 At “No Soul for Sale” they encourage the concept of coexisting, sharing, and collaborating through this open structure, using only tape to indicate exhibition space for each nonprofit, a move inspired by Lars von Trier’s 2003 movie Dogville. Ms. Alemani also believes the open structure forces the visitor to encounter the participants and the space in a new way; it forces interaction and informality. Participants Fairfax Dorn, of Ballroom Marfa, and Yael Reinharz, of Artis, both hope to gain exposure to a new audience of supporters as well as connect with other nonprofits. “It’s a brilliant idea to invite 40 nonprofits to do whatever they want. You get this cross-pollinated audience of people who are interested in all kinds of organizations. We want more exposure to people who are open to learning about art form other countries. It’s about connecting and recommending projects,” says Ms. Reinharz. With a large mural by the 22-year-old Israeli street artist Know Hope attracting a lot of attention, it is a likely possibility that Artis will make several connections. The piece tells a story of salvation and hope, and yearning for something better than the current situation, a rather apropos statement given the goal of the festival. Various forms of experiential art created unique environments offering respite from the crowds. A freight elevator turned temporary bar allowed entrance to only 15 people at a time, courtesy of GALERIE IM REGIERUNGSVIERTEL/ FORGOTTEN BAR PROJECT from Berlin. 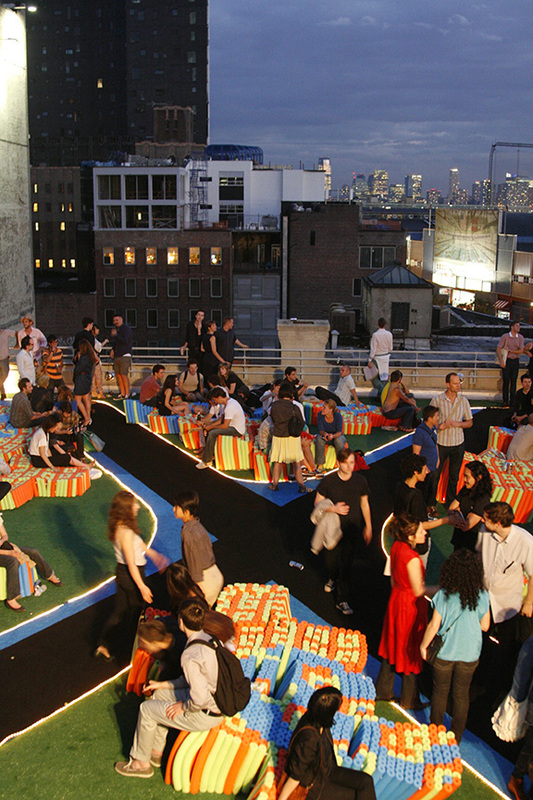 Nearby, an elevated, turf-laden platform by the Philadelphia based FLUXspace offered a birds-eye view of the festival. 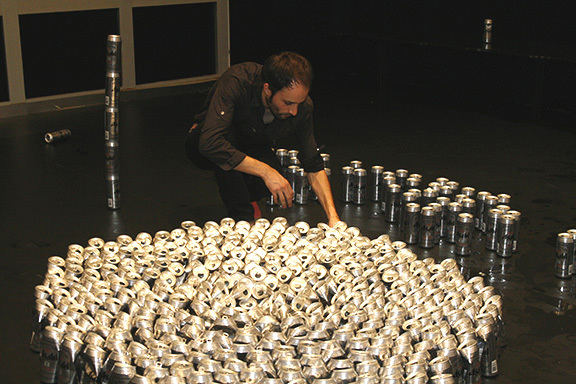 Latitudes, from Barcelona, set up an office base camp conceived by the artist group The Bruce High Quality Foundation. The installation features furniture and neon signage from an abandoned Governor’s Island Burger King restaurant. Video and mixed media installations were also prominent, whereas more traditional media such as painting and drawing were harder to come by, though White Columns, from New York, and Creative Growth displayed a series of framed drawings and paintings that looked fresh in a room full of video, sound, and other installations. With an advisory board made up of influential curators, artists, collectors, and other art world insiders, X is providing a platform from which we can address happenings and changes in our society. “We invited our colleagues, nonprofits from all over the world, to share with us the gift that we got, which is this space for free. We wanted to share this energy and enthusiasm with them,” Ms. Alemani explains. With a free space that is free of barriers, the festival is of course free to the public as well. And the public has responded. A building that has stood virtually empty for years was filled to capacity at last night’s opening. People spilled out, forming a line half way down the block, waiting to enter the lobby where another mass of people waited for access to the stairs and elevators. By 7:30 pm the rooms and stairwells were so crowded you could barely get out to make room for someone else to come in. It seems X has provided something we have been waiting for, a unique forum for sharing information and ideas, and a way to support cultural diversity and creativity. With organizations from New York, Shanghai, Tel Aviv, Berlin, Paris, Reykjavik and others, “No Soul For Sale” is a veritable melting pot of contemporary art, collaboration, and the free exchange of ideas and discourse.